The black vests of Rotherham Harriers were a-plenty at last weekends British Masters national road relay championships at a sunny Sutton Park. The Harriers fielded 6 full teams in total across the different age categories. All the relay legs were 3 miles of rolling terrain around tree lined paths of the charming park. In the morning there was a chilly wind but the atmosphere was soon warmed up by the women's races. The Harriers fielded teams in the W55 and W65 categories. Both ladies teams finished a fantastic 4th in their categories with standout performances from an inform Gillian Taylor who clocked the 11th fastest W55 time of the day in 22:40 mins to help them clinch the 4th spot. The W65 ladies team also had a good run and finished 4th overall with Jennifer Horan clocking the 10th fastest W65 leg of the day. 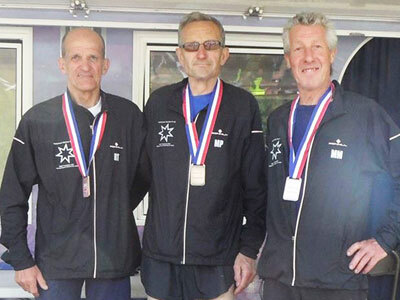 Next up at lunchtime were the men's M65+ and M55+ races. Team performance of the day was by the men's M65 team who put in a great run from start to finish with Mick Marsters putting the Harriers in the mix with a 20:13 first leg and 10th fastest M65 leg of the day handing over to Malc Palfreyman who picked up 2 places with another great run of 20:47 putting the team into 3rd. The final glory leg was taken up by Bob Tintinger who had a storming run of 19:35 and 2nd fastest time of the day and brought the Harriers home to pickup the bronze medal. The M55 mens team were led off by the always consistent Terry Eastwood handing over to Paul Clemmens and then Peter Neal who were coming back to fitness and carrying an injury respectively. But both put in a good run for the team to bring the M55 team home in 23rd place. Last up at 2pm were the young un's ! the men's M45 and the M35 teams. If anyone has any doubts of the quality of the field at the British Masters events then you need to look no further than the quality of the teams from the length and breadth of the country. The top 10 times in both these races were pure class. The top 10 M35 times were all under 15:23mins and the top 10 M45 times were all under 16:01 for the challenging rolling 3mile course. The M35 team finished in a credible 8th place with notable performances from an outstanding Gareth Sampson on the first leg with15:23 and the 10th fastest time of the day. The last leg was brought home by supremely talented Richard Harris who had hot footed it from watching his daughter race well in the Yorkshire Track champs in Barnsley just in time to run the last leg for the boys. For the Harriers M45 team, as always, Howard Darwin put in a solid and good run on leg 1 handing over to John Comrie who hadn't dared run all week due to an injury but was determined to still put in a run and get round somehow for the team. From the off John looked in trouble and in pain but somehow dragged himself around the course to hand over to relay debutant Andrew Roscamp. Andrew had a great run and managed to pickup 2 places on the way. On the last leg was Gary Claxton who had an excellent run and stormed through the field to pickup 4 places. 8th Rotherham Harriers & AC M35 1:41:131 Gareth Sampson (7) 15:23, 2 Chris Adams (4) 16:12,3 Steven Marshall (8) 17:22, 4 Ian Whyman (7) 17:05,5 Martyn Whyman (10) 18:55, 6 Richard Harris (8) 16:16. 46th Rotherham Harriers & Ac M45 1:26:031 Howard Darwin (40) 19:03, 2 John Comrie (51) 30:34,3 Andrew Roscamp (49) 18:52, 4 Gary Claxton (46) 17:34. 23rd Rotherham Harriers & Ac M55 1:00:101 Terry Eastwood (17) 18:45, 2 Paul Clemmens (24) 20:54,3 Peter Neal (23) 20:31. 3rd Rotherham Harriers & Ac M65 1:00:351 Michael Marsters (5) 20:13, 2 Malcolm Palfreyman (3) 20:47,3 Robert Tintinger (3) 19:35. 4th Rotherham Harriers & Ac W55 1:11:321 Gillian Neal (6) 23:05, 2 GillianTaylor (5) 22:403 Wendy Whitaker (4) 25:47. 4th Rotherham Harriers & Ac W65 1:29:121 Patricia Beighton (4) 30:03, 2 Brenda King (4) 29:54,3 Jennifer Horan (4) 29:15.